which new-generation light bulb corresponds to my old bulb? Did you know that the lighting in the average home uses around 16% of the total power consumption? This means the lighting in your home holds considerable cost-cutting potential! Replacing your old lamps with a modern alternative is a good start. When replacing an incandescent bulb or a halogen lamp, you will now have to choose between a LED or a compact fluorescent light. But what exactly is the difference? The comparison chart below shows you exactly which energy-saving light bulb or LED lamp you can replace your old incandescent light bulb or halogen lamp with to get the same amount of light (i.e. the power expressed watts). Think in terms of lumens and forget about watts! The light output of LED lamps continues to increase exponentially year by year. Which is why the comparison chart above merely serves as a guideline. Where a 7-watt LED lamp is currently required to deliver a certain light intensity for instance, in a year from now, this may well have dropped to just 5 watts, and is likely to have dropped even further to just 2 watts in four years’ time. Handy tip: the rule of thumb is to divide the number of watts of an incandescent light bulb by 10, which will give you the approximate number of watts of a led lamp. Looking to replace an old incandescent light bulb and don’t exactly know the equivalent LED lamp? The best way forward is to go by the number of lumens, which is now clearly specified on the packaging. Alongside the light intensity (number of lumens), the colour temperature is another deciding factor when choosing the right LED lamp. The appropriate colour temperature enables you to choose the ambiance you would like for each room. Colour temperature is expressed in kelvin. The higher the colour temperature, the higher the Kelvin rating and the more blueish the colour. Light sources with a (comparatively) low temperature tend to be more reddish. 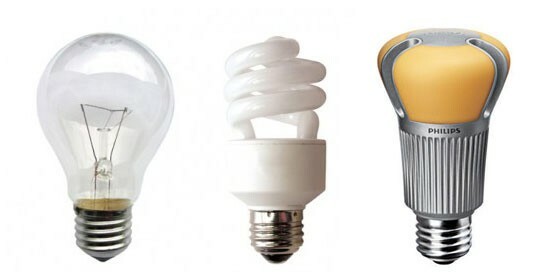 LED lamp or energy-saving light bulb? The energy-saving light bulb, also known as the compact fluorescent lamp, is actually a folded fluorescent strip tube lamp that fits inside a regular bulb fitting. contain a small amount of mercury: if an energy-saving light bulb drops to the floor and breaks, please be very careful how you clean it up because of the hazardous mercury vapours. get very hot compared with LEDs; they dissipate energy on heat, although to a lesser degree than traditional incandescent light bulbs or halogen lamps. most CFLs take a while to work up to full light intensity, which makes them unsuited for use in places where the light is switched on and off for short lengths of time (like the toilet). LED lamps are made up of clusters of light-emitting diodes (LEDs). As they are so small, LED lamps come in all shapes and designs. Can the brightness of LED light bulbs be varied? Which colour temperature shall I choose for my LED light? How can I save energy with my current lighting installation? What are the advantages of the new-generation light bulbs?